You Know What They Say In Ten But Like Explains A LOT In Akagi?. . .
Why does Akagi always go head first into outrageous danger with no fear of death? He so so utterly and completely believes in reincarnation that he doesn't even hesitate on acting like a man. He can not be killed, by any means. You're right, I actually screencapped that conversation because it meant a lot to me. I cried at the end of Ten. so he is afraid of dying, and afraid of living as some one else, which is about the same as dying... he just wants to live being true to himself, nothing weird there... well actually in a world full of hypocrisies a person being true to himself is quite a rare thing. 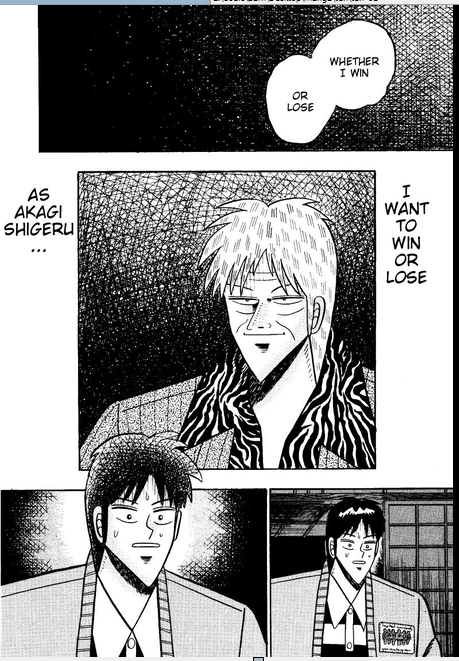 Sounds interesting, but I never thought of Akagi as believing in reincarnation. 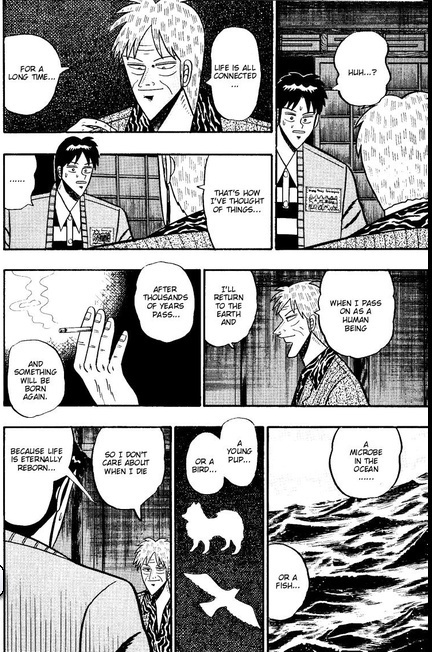 The way I always thought of it was that Akagi was intelligent enough to reach an existential crisis (questioning existence and life) at a very young age also partly due to a rough childhood induced by a broken post-war country. He was also intelligent enough to reject common solutions like religion or ignorance. He chose his own philosophy, that he explains at the end of Ten, which I understood as a variation on a nihilistic view with him only really caring for his own consciousness and mind, but not valuing life itself even a bit, seeing life and consciousness as separate things. That's why he was never afraid of death. That's how I always understood it, anyway. Yeah that's why im comparing dying with losing consciousness, it would be death of personality, even if his body goes on working is like living a coma that is about the same. 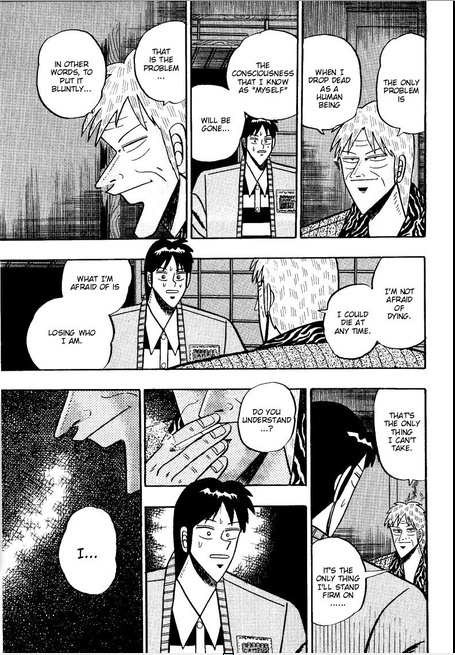 Him being reincarnated or not is meaningless since Akagi... what conforms Akagi is already long gone. It's still really tragic that he died, especially considering the way he did so. But if you think about it, it was probably the most appropriate way he could of. It's not like he would lose a life-or-death gamble or anything. Subject: Re: You Know What They Say In Ten But Like Explains A LOT In Akagi?. . .